Fantasy-themed pokies seem to be all the rage at the moment and the latest video slot from Play’n Go isn’t straying from the trend. If you ever liked playing board games with wizardry, castles, and magic, you’re going to enjoy playing this slot, especially with the creative potion animations. 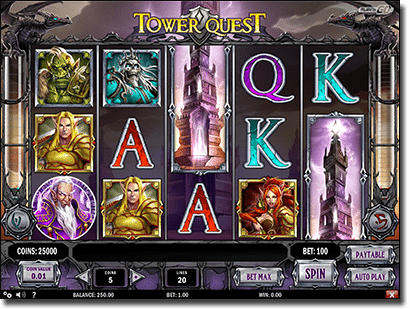 Tower Quest takes place in a mystical and eerie world with dragons sitting on two level indicators which are important parts of the creative and unique round – which all new slots seem to be adding to their slots lately. The audio coincides with the theme creating the feel that your are playing a fantasy PC game rather than a slot machine, but it isn’t too flamboyant in that we have to mute it in our opinion though the option is there if you prefer your own audio. Since Play’n Go place a strong emphasis on creating games for mobile devices, this game is also available on your smartphone or tablet, as well as laptops and desktops and we have found the best place to play Tower Quest online. Play Tower Quest slots online in AUD currency at any of the secure, reputable casino sites recommended in our table above. 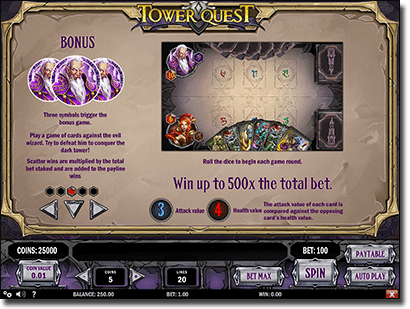 Featuing a 5-reel and 20 payline format, Tower Quest sees wizards, green goblins, skeletons, towers and the usual J, Q, K lining the reels. Additionally the usual wilds and scatters are integral to gameplay. The animations involved during gameplay add to the ambience the slot creates. Wild symbol – The wild symbol is the tower icon and appears on the reels as stacked and can take up all positions on the reels if you are fortunate enough. Scatter symbols – This is where the standard format changes up a bit. The purple wizard and the red and blue flasks all count as the scatter symbols. The reason there are three symbols as opposed to the usual singular scatter symbol is that it counts towards the creative free spin round later on. When landing a blue or red flask you will notice they open and fill the two level indicators corresponding to the red or blue eye colour of the dragon. The bonus feature is quite standard and in order for players to trigger it, they must land the evil wizard, who only appears on the first, third, and fifth reel, on all three reels in the one spin. From here the feature is activated and you will be prompted to roll three dice in order to choose which cards you will be using. The cards will then be compared, similar to how you compare Pokemon cards, in terms of the highest attack value and health of the card in association to what the evil wizard has. You will win prizes accordingly and you can actually win 500x your initial bet if you win more cards than the wizard. Additionally, If you roll two or three numbers that are the same you will have a better advantage over the evil wizard. The free spins is when the game gets creative. As we mentioned before, there are two level indicators either side of the reels which the dragons are perching on, and every time you land a red or a blue flask a video animation of the flask opening up and filling the level indicator with the corresponding colour will occur. When each side reaches a certain level you receive a certain number of free spins and bonuses. Collect five blue flasks and you receive one free spin with the middle reel completely wild, along with a 2x multiplier. Collect ten blue flasks and you receive a free spin with all the symbols which are high values, such as the dragons, the female and male heroines, etc, being replace with wilds. Collect 25 blue flasks and receive a free spin with a sticky wild accompanying each spin on a reel set. Collect 10 red flasks and receive five free spins along with a 3x multiplier attached to any wild wins. Collect 20 red flasks and receive five free spins along with the male and female heroines being replaced by wilds. Collect 30 red flasks and get five free spins along with each spin being accompanied by a sticky wild on a reel set. While the fantasy-themed pokies are becoming overpopulated in our opinion, the creative addition to the free spins round makes this an entertaining slot to play. While top leading software developers have been joining forces with other software providers, such as the partnership between Microgaming and Rabcat, in order to produce unique and game-changing slots, Play’n Go have done this on their own and it might just be the factor that ends up boosting their profile. Since they have created a unique slot independently, we can only expect better things to come. Additionally, the fact they have made this available not just for desktop users but for mobile users too gets bonus points from us. While Play’n Go software is utilised by many Internet casinos, we recommend House of Jack online casino as the best place to play Tower Quest. The online gaming establishment is highly regarded as a trustworthy online venue and prides itself on providing a fun and safe gaming environment. Additionally, House of Jack has a mobile-friendly interface accessed via your mobile browser on your smartphone or tablet, making it the perfect platform for the mobile version of Tower Quest to be accessed. It is still safe to play on a portable device and it has the same data encryption technology which the desktop version has. For House of Jack, the data technology is the same that major financial institutions utilise. Additionally, there is a payout rate of 96.24% on Tower Quest. If House of Jack isn’t your cup of tea, there are plenty of other leading casino sites that offer Tower Quest and Play’n Go software, just refer to our casino table above for the full list of our recommended Play’n Go casino sites. Sign up for an account at House of Jack and enjoy Tower Quest video slots and hundreds more high-quality, fun online pokies for real money.